Hurricane Maria, the 10th most intense Atlantic hurricane on record, made landfall in Puerto Rico on September 20, causing widespread flooding and damage to infrastructure. Three months later, 35% of all residents lacked power and 14% had no tap water. Fatalities stood at 499 for the island as of November 20, with Gov. Ricardo A. Rosselló ordering an official review and recount on December 18. Nearly 500 residents were still living in shelters in mid-December, and more than 472,000 homes were destroyed or badly damaged by the storm. Much of the electrical grid has been rebuilt, but a massive outage in the capital of San Juan on November 9 signaled a fragile recovery. Hundreds of thousands of Puerto Ricans have left the island since the storm, United Nations human rights experts have sounded alarms about food shortages during the winter, and mold has become rampant throughout the island. However, telecom services are improving, commercial flights are back to normal, and the majority of supermarkets and gas stations are back in business. 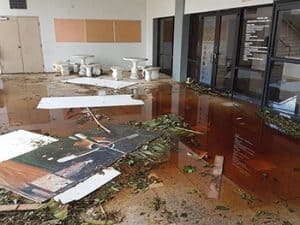 All of the University of Puerto Rico’s (UPR) 11 campuses suffered infrastructure damages, but the hardest hit were those at Bayamón, Cayey, Humacao, and Río Piedras. Evelyn Milagros Rodríguez, research, reference, and special collections librarian at UPR Humacao, wrote about her experience for the nonprofit Conversation website on October 26. The library was the hardest hit of all the buildings on that campus, she says. “It’s mold-infested and the roof is leaking, so there’s a lot of work to be done in both repairs and cleaning before students can use it. The mold has gotten into our collection—from books and papers to magazines—and most of the furniture and computers will have to be repaired.” Some of those repairs took place, and the campus reopened on October 30. The library staff at the Bayamón campus were able to reenter the library on October 5. Librarian Myrna Lee Torres-Pérez says the experience was “overwhelming, with everything full of mold, rotten carpets. We lost collections.” Classes also resumed on October 30, and the library is at least partially open. 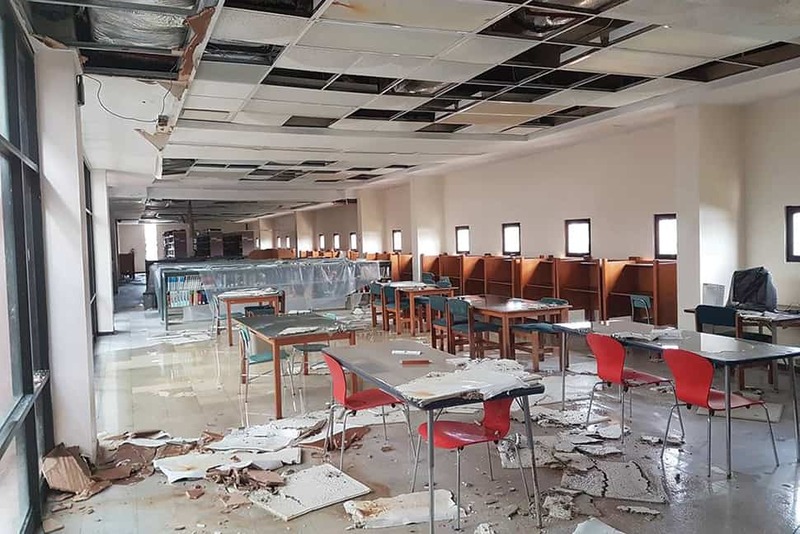 The main library at Río Piedras incurred some damages, as well as the law library, which had a lot of water damage. Libraries at the Cayey and Mayagüez campuses were also affected. All UPR campuses have now reopened for classes. In San Juan, the conditions at the Evangelical Seminary of Puerto Rico were perhaps typical of libraries that had less damage. Director Milka Vigo wrote on October 13 that “water poured over the acoustic ceiling near the service counter, soaking about 50 books, of which 31 were discarded because they were filled with mold. Another portion of the ceiling gave way above one of the aisles. Without electricity to turn on the air conditioners, mold will proliferate.” Classes here have also resumed. Hurricane Maria damaged the wooden roof of the San Juan Community Library, which was about to celebrate its 30th anniversary, and flooded into the main building. It is operating without power and currently seeking funding through the GoFundMe platform. The public library in Guayanilla also took on water. As of the beginning of November, the Puerto Rico Department of Education has not completed a census of the number of schools that were destroyed or damaged, although the US Army Corps of Engineers was in the process of visiting each one. Those that were able to reopen did so on October 24. The library of the Marcelino Canino middle school in Dorado was one casualty. A layer of mud covered the floor, books were flung all around, and the smell of mold permeated the building. Several US universities launched a nationwide effort in October to help relief agencies on the ground by updating the open source maps that Federal Emergency Management Agency and Red Cross workers use. During mapathons, student and faculty volunteers used satellite images from OpenStreetMap to locate landmarks and verify the condition of key bridges and buildings. 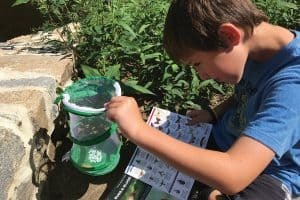 Some public libraries in the US Virgin Islands (USVI) have recovered from the hurricane. 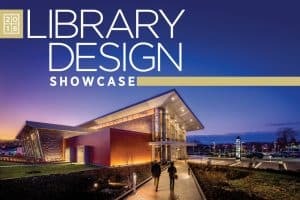 The Charles W. Turnbull Regional Library on St. Thomas and the Florence Williams Library on St. Croix were open on a limited basis on October 30. Others still had unrepaired damages, and on November 6 USVI Senate President Myron Jackson urged cultural agencies on the islands to apply for public assistance, since the deadline had been extended through January. ALA continues to support libraries damaged by Hurricane Maria through its Disaster Relief Fund, and it also offers a list of resources for dealing with disasters at Libraries Respond.